Our wifi had been slow and sporadic for the past three months. Since I had recently upgraded to a higher speed, I would have expected it to have become faster and more efficient, not the opposite. Buffering and waiting was becoming the norm and I’d fallen into the trap of turning the wifi off and then back on again. We’d have some success for a while and then another device would drop the signal. Turn wifi off, turn back. REPEAT. My strategy was working but it certainly wasn’t efficient or effective. After far too long, I reached out to my network provider for help. With his advice and direction, we walked through some possible strategies to improve the wifi and get the most out of what I was paying for. He also had me do a full reboot of the modem. BINGO! Like magic, we were finally able to use our devices and our wifi network to their full capacity, with efficiency and effectiveness. I regretted waiting so long to reach out, change and improve. Twenty-three years ago I began teaching math the best way that I knew how. I taught it the way in which I had learned it. Over the course of four or five years I had perfected the craft: Me at the front of the room. Take up a multitude of homework textbook questions from the night before (20 minutes), teach textbook driven lesson (20 minutes), assign textbook questions, students begin working silently and independently on their many questions (20 minutes). I sit at my desk and kids come to me if they have any questions; there was usually a long line (never enough time). Assign the unfinished textbook questions for homework (an hour or more). Next day…REPEAT. Throw in a few quizzes and an end of unit review and test. Mark, return test, take up test. Kids who did poorly on tests and quizzes stayed in at recess and after school to “catch up”. Move on to next unit in the math text to “cover” the next strand. Don’t stray from the text, continue to push forward, cover everything in text by May, leaving me time to review for the Grade 6 EQAO test, which the kids would write at the end of May. Throw a grade 5/6split class into the mix! Do all of the above times 2. Teach, memorize, drill. Teach, memorize, drill. Homework. REPEAT! Apparently, my math class routine was working because my kids would generally score at or above the “provincial standard”, and my success as a math teacher was reinforced and celebrated. But a few nagging questions still persisted. Did my students really understand math? Did they see it applicable to their everyday world? Did they see the relevance? Did they do the math because they wanted to or because the had to? Did they love math? Did they even like it? What about the kids who simply didn’t get math? Was my math program really effective? Dare I ask…. Could it be better? Every year, in December, I strayed from the rigor and routine of my math program and textbook. The math that we did during December was different, fresh, real and relevant. This was “Bang for the Buck math” and it kind of felt like a “reboot”. But back to the grind and the old ways in January, when I’d try to muster up as much enthusiasm as I could and ask my kids to take out their math texts. Until one day Erin groaned and asked “Mr.C, when are we going to do some REAL math again?” Erin expressed what everyone in my class (including me) was feeling! I had a choice, continue the same ol’ routine or change. On that very day, at that exact moment, I changed. I ditched the textbook, took my students outside and started building snow prisms. EUREKA! With her simple question, Erin forced a reboot of my math program! Her great question forced me to make ongoing reboots to my math program over the course of the following 15 years. Questions from the real world Today all math questions come from the world that exists around my students, not from within a textbook. My students are far more engaged by these types of questions and are able to make connect the math they are doing to their every day life. Below are just a few questions that challenged my students thinking over the past week. Fewer Questions I assign my students fewer questions (I actually now call them challenges). The challenges are rich, have many entry points and a multitude of opportunities for students to extend their learning and understanding. Using questions such as the above also allow for ease of differentiation. We focus on quality opposed to quantity. Multi-strand Challenges In the real world, math is not compartmentalized into strands, nor is it in my classroom. Math can also be easily cross subject integrated as well. Read how a simple Snowflake led to An All Day Math Inquiry. It must also be noted that teachers who fall into the “textbook trap” end up teaching many concepts that are not necessarily in their curriculum. Knowing your curriculum will allow you to easily blend strands, allowing you to more effectively and efficiently cover your curriculum expectations. How many expectation do you think were covered in the math challenge below? Teacher in the Middle I try to spend as little time as possible at the front of the room teaching math to my students. Yes, there is a time and a place, teacher directed is important, but I find my time is much better spent being present in my students’ learning. I do, however, always start with a whole class warm up that is directly linked to the challenge for the day. Challenges such as the above allow me to circulate about the room and listen to my students’ thinking. At many points I bring in small groups to debrief and teach, at other times, students model and share and at other times a whole-class “regroup” and mini lesson is required. Every day and every class is different. Students Talking As alluded to above, I now spend less time talking and more time listening. Students talk and share their math learning and strategies with their peers when working on whole, small group and paired math challenges. Talking and sharing helps them learn, understand, reinforce and question. Importantly, students are also responsible for working on challenges individually as well. By being present in my students’ learning I am constantly assessing to understand where each of my students are at and what I need to do to move them forward. So, when I do talk it’s more focused to meet the needs of the individual students in my classroom. I have also rebooted my learning space to allow more freedom of movement which enhances the work environment and overall efficiency. Below is my transformed learning space. Portfolios Quizzes and tests have long been replaced by portfolios. Students use their math workbooks to do their day to day math practice and also keep low tech (paper) and high tech (Google Classroom and Flipgrid) portfolios. Within their portfolios, many artifacts of learning are filed. In addition to being present everyday in their math learning, these many artifacts become the basis for my assessment and my students’ own self assessment. Low Tech Portfolios Simple Folders My students receive a folder with two pockets. Inside the two pockets are a total 5 smaller folders that are colour coded, one for each math strand. Students file their S.W.I.K (Show What I Know) work within the folder that hits the strand of focus. Since I spiral my math program, I have a system for tracking what expectation or concept we’ve hit and how often as well. 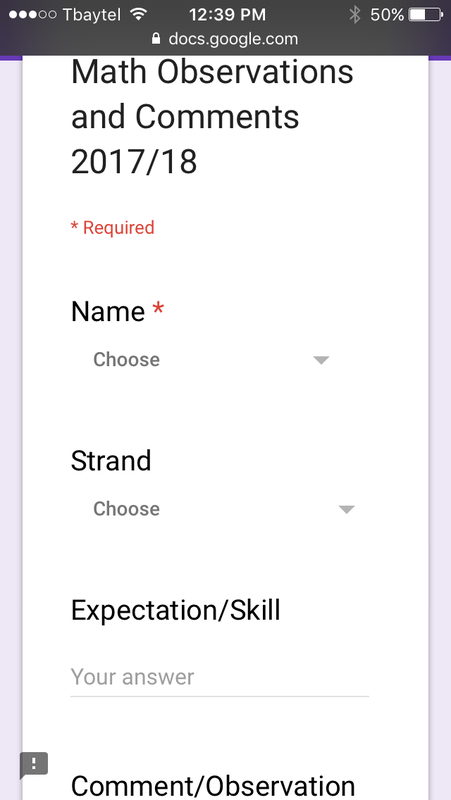 High Tech Portfolios Google Classroom With Google Classroom I can easily assign a variety of challenges to my students that are differentiated to meet their learning needs. Students have access to an unlimited use f tools to demonstrate their learning and I can watch them work in real time and provide individualized, timely feedback. On many occasions I’ve presented at workshops out of town, worked with participants to develop a real world challenge for my students, assigned them the question via Google Classroom and then watch as my students worked to solve the problem. I’ve had teachers at the workshops provide my students with prompts, feedback and next steps. This high tech portfolio is a true game changer. Flipgrid I use Flipgrid to have my students share and “talk through” their math solutions. This tool allows students to quickly and efficiently share their solutions with both myself and their peers. I can listen to and watch their math thinking and record my feedback to them. Of course, because of the power of tech, I can access their Flipgrid portfolios anytime, anywhere. Just imagine the possibilities. Feedback Focused I used to spend hours evaluating and marking homework, quizzes and tests. My marks book would be chalk full of data. Kids would receive a multitude of math marks. My “Level 4s” would celebrate, “3s” would be content and my “2s” and 1”1s’; deflated and defeated. I also struggled with the fact that by the time my students had reached grade 5 and 6, they had plateaued; it was difficult to move them forward and upward. With a focus now on feedback, usually given verbally, in the moment, my students use the information given to them to make great strides in moving forward. Feedback can come in a variety of forms and received in whole and small groups and individually. Leveraging Google Forms on my iPhone with the voice record option has allowed me to efficiently record antidotal data while in the moment. A copy of the form can be accessed here. Feedback Now The more immediate the feedback the better. Receiving it two, three days and even a week later, proved almost useless to my students. Just in time, immediate, focused feedback has been the key to success in my classroom. Tech Leveraged As alluded to previously, technology has provided a tremendous reboot to my math program. The ability to build and differentiate math challenges has become almost effortless. Opportunities for students to build digital math portfolios has provided countless opportunities for success. Leveraging Twitter in our classroom has allowed us to learn and share our math challenges and strategies with classes from around the globe. Video has allowed another opportunity to take my students on math learning journeys, where never imagined before. Check out how I took my students to Niagara Falls and how we did math along the way! mPower has become my one “go to” online math game to help build and reinforce my students math skills. All Ontario curriculum based! Math Anytime, Anywhere In my classroom, math used to begin at 2pm and end at 3:15pm. Now, our eyes have been opened to learning math anytime, anywhere. The incidental math that happens allows me to spiral back (or forward), to build and reinforce math concepts and skills. During DPA we’ll use the clock to help us learn about fractions, decimals and percent. When creating groups, the same concepts can be easily covered. We look for geometric shapes and patterns when jogging outside, we’ll manage data that we collect when playing a variety of games. We play math dice games during indoor recess and when we’re done our work. When I started thinking outside of the confines of the math block and textbook, the opportunities for learning math were endless! HomeSHARE You’ve heard about the type of homework I used to assign. Lots of textbook questions, lots of repetition and lots of frustration. The kids who could do two or three questions, could do ten. What was the point of wasting their valuable time at home? The students who couldn’t do two or three questions certainly couldn’t do ten! This only created a huge amount of frustration and anxiety for students and parents, if in fact, they were there to support their children while doing their homework. I’ve rebooted to HomeSHARE. One prompt for my students to discuss and share (and not always necessarily math) with their parents. My students, their parents (and I) love it! Dynamic and Fluid In hindsight, teaching from a text was very rigid and structured. It also wasn’t very logical. Textbook teaching is very strand specific. It didn’t allow me to combine strands, teach concepts that went together or provide many opportunities to differentiate. Rebooting allowed me to be far more dynamic and fluid. If I want to jump immediately into measurement after teaching decimal numbers, I do. If combining data management with measurement concepts makes sense to me and is an obvious next step, I do just that. Sometimes, my students math inquiries also dictate where we “go” with our math. Fluidity allows me to think outside the box with my students and embrace learning opportunities when they arise. For example, my students initiated a project in which we repurposed K Cups to learn math. We also created a video to show the many different ways K Cups can be used for math and we developed a webpage to share our resources. Understanding When my focus changed from teaching math through the rote learning of multiplication facts, algorithms, concepts and rules to deep understanding, academic success improved greatly. My students now solve math challenges through a variety of different means and strategies depending on the specific numbers with each challenge. For example when playing a game of Triple Dice, it quickly becomes evident how deeply my students understand multiplication simply by listening to them talk their way through how they would multiply the three rolled numbers together. Mistakes Understood As a kid growing up, I was taught that mistakes were bad and that all necessary steps should be taken to avoid mistakes. This in turn, most likely, caused me to have perfectionist tendencies, which more than likely seriously impeded my learning! In my class, mistakes are seen as a natural step in the learning process. When mistakes are made, we work to understand what they were, why we made them, correct them, learn from them and grow. The “math mindset” in my classroom is that math is “challenging and fun” The kids will tell you this and so will I. Isn’t this what we want learning to be all about? It is my job to challenge and support each and every one of my students in my classroom. It is also my job to cover the curriculum. BUT, how I decide to do this is up to me. Thankfully, I’ve changed, evolved and “rebooted” my math program over the course of my 23 year teaching career. If I hadn’t, I think both my students and I would agree that math would seem pretty hard and boring. What does your math program look like? How have you evolved, changed and rebooted how you teach math? What works? What doesn’t? I’d love to hear your thoughts and questions? Want to continue the discussion? I’ll be presenting “Reboot Your Math Class” on May 6, 2018 for #MADPD You can join me virtually, live and for free…it’s the whole idea of M.A.D(Make A Difference) PD. Send me an cherandpete@yahoo.ca or tweet me to join me! Hello! We are a group of students in grade 5 and 6 who attend St. Elizabeth School in Thunder Bay, Ontario. We are your neighbours to the south and would love to learn more about the communities that you live in! This year we have travelled with Paddle, by reading “Paddle to the Sea” through the great lakes to the Atlantic Ocean. We’ve also read “Fatty Legs”, met Olemun and learned about her community in Canada’s high Arctic. We also have pen pals in the United Kingdom and our “connected classroom” learns and shares with people from communities all over the world. We’ve come to the realization that we know very little about some of the communities that are closest to Thunder Bay. So we’d love to connect with YOU! First we’d like to tell you a little bit about Thunder Bay and some of our favourite places. Last year Mr.C’s class wrote about their most favourite place in (or around) Thunder Bay. You can read about them by click on the map below. Make sure you click on each pin! We want to learn about YOUR Community! We would LOVE to read about YOUR home communities! What are your FAVOURITE PLACES in your community? What are your STARS and WISHES for your community? If you would like to connect, please send us an email at pcameron@tbcschools.ca and we’ll send you a link to have your class fill out a simple form. We’ll then add your community to a Google map (it’s coming) so we can all learn and share about one another’s communities! We are hoping to eventually take our connections a step further by starting up pen pals, and hosting Google Hangouts and podcasts. It will lead you down many different paths. Paths straight and flat, easy to navigate. Paths twisty-turny, with many unknowns. Paths filled with obstacles, providing a challenge. Paths that meet, bring things together. Paths travelled alone require courage, provide freedom. Paths travelled together give support and understanding. Paths that are seemingly endless. Require will and determination. Some paths arrive at a summit. Providing gratification, but always seeking more. Regardless of the path you’re on…. and determine where you end up. Where will your paths lead you? Happy New Year! I hope you had a wonderful holiday! I hope you had a chance to spend time with family and friends and I hope you took time to rest, relax and reflect. Only a few short months ago you entered our classroom in September and since then we have accomplished a lot! We have learned, questioned and supported one another as a community of learners. Our learning has taken us down many different paths. Sometimes the paths were quite straight, flat and easy to navigate. Other paths were more twisty-turny when we never really knew what was around the next corner. Some paths were full of many bumps and obstacles that made travelling down them very challenging. Some paths met and converged and others didn’t. Some of you travelled further down some paths than others, and we all found our own paths. Regardless of the path travelled, I am proud of each and everyone of you! We have come to a cross roads of our school year. January is a good time to reflect; to look back and to look forward. As you reflect on the past few months of school, what learning journeys do you remember? What did learn? How were you challenged? What are you most proud of? What did you accomplish? What do you still want to accomplish? How did you make a difference? Take some time to reflect on the past four months of the school year. Use your Writer’s Notebook to collect your thoughts. Below are some of my highlights from the past four months. They may help you reflect. There is no more powerful tool in the assessment for learning cycle than presence. This summer my seven year old wanted to learn how to tie his shoe. He had tried on many previous occasions but hadn’t been successful. Perhaps he just wasn’t ready or perhaps I just hadn’t given him the necessary support he need to succeed. On the first day, we sat down together and I watched and listened to him talk out the steps to tying his shoe. He wasn’t very far along in his learning. He knew he needed to start by putting the right lace over the left and do “the pull through” but was having trouble making the loop. I sat with him and tried to explain the process and he attempted the loop again. After more careful observation and discussion, I modeled how I make the loop on my own shoe. This led to Kai being successful at making a loop but he wasn’t ready for the “wrap around”. After about 30 minutes of learning we were both done. I couldn’t push any further. I praised Kai for his success and reiterated where we were “at”. I didn’t provide him with a mark. (What was he… a level 1 or a low 2?) But he and I both knew what he needed to do next to succeed at his ultimate goal of tying his shoe. Throughout the day I observed him practicing the loop and attempting the wrap around. The next morning, after breakfast, Kai came to me wanting to take the next step in tying his shoe. I was quite busy at the time, but put my job on hold so I could be present in Kai’s learning. We sat down again and reiterated what we had learned and where we were at. Kai knew “the wrap around” was what he had to tackle next. He did the first three steps with more confidence and speed. The wrap around would come today, I just knew it. But it didn’t. Regardless of how hard Kai tried, he just wasn’t getting it. I modeled. I had him talk through the process again and again. There were tears and frustration. I told Kai that I was proud of his effort and determination that he was learning and learning takes time. I didn’t provide Kai with a mark. (Where was he at? Level 1 or low 2 or low 1…. he did require much assistance). He and I both knew what he needed to do next to succeed at his ultimate goal of tying his shoe. Throughout the day I didn’t observe him practicing the loop or attempting the wrap around. On day three, Kai didn’t come to me wanting to continue to learn to tie his shoe nor did I suggest it. Perhaps he needed a break. The following day, after breakfast, I suggested we try the wrap around again. Reluctantly, Kai went to put on his shoes, but I suggested he keep them off today as we practiced. With his shoes in front of him, Kai talked out the left over right and the pull through, the loop was made with ease and now for the wrap around and…. FAIL! What was going on? Why couldn’t he get it? I was getting frustrated, never mind Kai! Again and again we tried. Again and again I modeled. Finally, after watching one more time, I realized that when Kai was doing the wrap around his smaller fingers were slipping. A small readjustment and BINGO. At that time, Kai’s friend Sam had come over to our trailer (we were on a six week camping trip together) for a visit. Kai was eager to show Sam everything he had learned about tying his shoes. Sam watched patiently and praised him for his work. Sam and I both knew (and I think Kai knew too) that he was close to reaching his goal of tying his shoe. Sam slowly modeled to Kai how he ties his shoe and I left the kids to their own devices. I GOT IT! Kai soon yelled from the interior of the trailer. After some quick modeling and different feedback from his older friend Sam, Kai had moved from the “wrap around” to the “push through” and pull! When I reentered the trailer I watched Kai tie his shoe independently for the first time! By no means was it perfect, but Kai had tied his shoe! I didn’t provide him with a mark. (What was he… a high level 2 or a low 3?) He had tied his shoe, but was done with some assistance and it certainly wasn’t perfect. But he and I both knew what he needed to do next to succeed. I watched Kai throughout the course of that day independently practicing tying his shoe. Many a passerby walked by but I’m not sure that they thought he was a very proficient shoe tier. In fact, I’d argue that most thought he couldn’t tie his shoe at all. But he was getting there. He was getting better and better with practice and little bits of help, advice and support from his mom, friend Sam and myself. Over the next two or three days Kai continued to practice and learn how to tie his shoes. He was motivated not by the praise he received from me (and certainly not by the marks) but by the shear love of learning and the empowerment he felt as a result of it. My role in Kai’s learning was to be present. I believe our presence is the most powerful tool a teacher has. Going with the Flow: Mystery Skypes and Bucket Lists! Sometimes you just have to go with the flow and recognize an opportunity for learning when it presents itself. Brodie is an exchange student from Australia who has come to live with our family for 2 months. He’s only been with us for ten days but we all have learned so much from one another already. Yesterday Brodie had some time unexpectedly freed up in his high school schedule so I invited him to join me at St. Elizabeth School for the first hour. He accepted the invitation immediately. When my students entered their classroom a buzz of excitement filled the room. They knew who Brodie was, I had told my students about him. They giggled when they heard his accent and immediately wanted to ask him questions. It stuck me that this was probably the first time they had meet someone from a different continent. So… what t do next? I really didn’t have a plan. After the initial excitement and introductions may kids settled into their books while listening to waves crashing on the beach. I had the technology to bring the ocean to my classroom, so I did. The tone was set. The questions came quick. While referencing the map of Australia in the almanacs the kids asked Brodie if he lived on the coast, in a large city, in the north or south, on a peninsula and in which state. As we narrowed in on Brodie’s home city of Adelaide, each question brought forth great discussion. Adelaide, as my students could see, was far different from Thunder Bay! The kids even marvelled at the different money that Brodie pulled out of his wallet to show them. Brodie said that he had already tried persians and maple syrup and heard of many of the places they had suggested (in fact we had planned a Christmas holiday trip to Sleeping Giant Provincial Park) and many were on his “bucket list.” As much as we wanted Brodie to stay, our hour was up and he had to head over to St.Pat’s to attend period two. As Brodie was saying his good byes someone can up with the idea of creating bucket lists for Brodie…. so that’s exactly what we did! Our family will enjoy sharing my students’ bucket lists for Brodie this weekend and checking many of the ideas off over the course of the next two months! What opportunities for learning are presenting themselves to you? This week Brodie came back to our class for another visit! We helped him fulfill another one of our “bucket list for Brodie” ideas by having him join us in a game of King’s Court. It was an intense game of good fun! Brodie made a connection with one of my students and inspired him to run (for the first time) during warm ups. He also joined the young boy at recess time and played catch with hm. During third block, Brodie spoke with my students about Australia’s Indigenous peoples and we compared and contrasted their culture to the FNMI cultures of Canada. He also spoke of Australia’s “lost generation” and we told him about what we had learned about residential schools in Canada. We had a lot to share since we had just finished reading “Fatty Legs”. Brodie also shared a couple Australian dreamtime stories and we learned, through legend, how the kangaroo got its pouch. Finally, we learned about traditional Australian dot art and we were eager to try our hand at it! Thanks again Brodie for visiting our class. We love learning with you!